As mentioned in yesterday’s blog, we have tallied the results of our New Design Survey and the top three are: “Au Naturel,” the “Cottage,” and the “Prairie,” in that order. In reviewing the comments, we were surprised and intrigued by the spectrum of opinions and ideas. Some folks felt the designs were too busy, many wanted more design added. The primary source of debate is the wings. The number of requests we received to produce the Absolute Steel Hybrid without wings has led us to the idea of providing you the option – wings or no wings. We believe, because this will be your stove, you should have it your way. “Nice but a little over done”. “I like the design shown because it is simple”. "This stove celebrates classic beauty in an artistic way”. “Like the free form design. seems to go with the stove lines well”. “This is my favorite design. The circular cut of the lines of the tree on the front just does something for me”. “Love the design; hate the wings”. “Prefer no wings, Design has a fairy tale feeling”. “I like the asymmetry of this design. The asymmetry could be extended to the shape of the wings (extend the height of the left wing and change the right wing to more of a "P" shape)”. “Beautiful design. I like how the tree branches over the top onto the other side”. “Very unique idea. I can't go back but thought there was like a crow on top or somewhere. I would make this an owl or another bird. 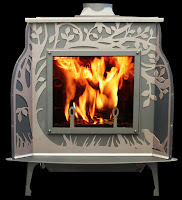 Crows don't fit with the beauty and gracefulness of this stove. Again the wings are necessary here to have the tree trunk. Nicely done. I would make sure the andirons are not a fir type tree but a deciduous or even an owl or other bird to match”. “Very good looking - every picture tells a story (Rod Stewart)”. “Ok, but kind of generic in the depiction of the outdoors”. “Fits in with Vermont living”. “This looks like it belongs in the Idaho Mountains”. “My favorite. It might look better if the tree line, top and bottom, were a bit sharper in detail. How about some paddles for the canoe”? “Mountain moon and trees above the window are my favorite part”. “Even with wider wings, I like it”. "Too much going on. Do not like the wings”. “Don't like “wings" - too much design”. “Not a fan of the wings”. “Definitely the best design with wings”. “Very cohesive style, and just the right amount of decoration”. “I really like the feel of this stove. If the hinges were left out of this design on the top and bottom it would be more eye appealing. I visualize the hinge more on the ash lip instead of the face”. “Again, nicely done, but am very tired of the gingham country thing that's being so badly overdone. Reminds me of it, so it might well sell”. “I think the Prairie should be referred to as the "Medieval", because it has the hammered metal look of olden days. A very attractive design”! “This stove would benefit from pierced wings (e.g. patterned openings thru the wings)”. “Might be okay but needs some design on the wings to dress it up a bit”. “Like this design in black. Not sure about the wings on this line of stoves”. “Prefer no wings, the design is a bit harsh”. “I like the slimmer wings”. As you can see, we have been getting some very interesting feedback from our readers. We appreciate everyone’s ideas, suggestions and opinions, and we are busy fine tuning the designs based off reoccurring suggestions and will post additional images as they become available. 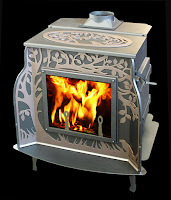 The drawing for the Absolute Steel Hybrid Stove is tomorrow!! We will be announcing the winner in the afternoon, be sure to check back to see if you are the winner of our Absolute Steel Hybrid.